I had spent a good deal of time and energy with Greater Flamingos in 2014. The first time I ever spotted them was during last summer. They had descended from the skies to the Annamalaicheri backwaters. A month or two later, I spotted them at the Pallikaranai Marsh. Again, towards the end of the year, during a satellite launch at the Pulicat Lake. Despite these sightings, I just could not establish a bond with them. Unlike with many other birds, the sentiments I shared with the flamingos seemed perfunctory. It was neither personal nor profound. Earlier this year, in January, we fell in love the right way (assuming there is one). I had woken up later than usual for a Sunday. I was on panic mode because bad things tend to happen if I don’t leave the house for birding by 4:30 am during weekends. I had planned yet another trip to the Pulicat Lake in hope of seeing an Osprey – a bird of prey that still eludes me. I drove as fast as I could. Unfortunately it turned out to be a windy day, which isn’t conducive to birding. I prepared myself to walk away empty-handed. I had only seen a few Purple Moorhens, Northern Pintails and Painted Storks in about three hours. I then spotted about a hundred Greater Flamingos chilling out by the river shore. At first I wasn’t too thrilled considering our unsentimental history. And since it wasn’t too uncommon to find them here. But then I saw something peculiar. 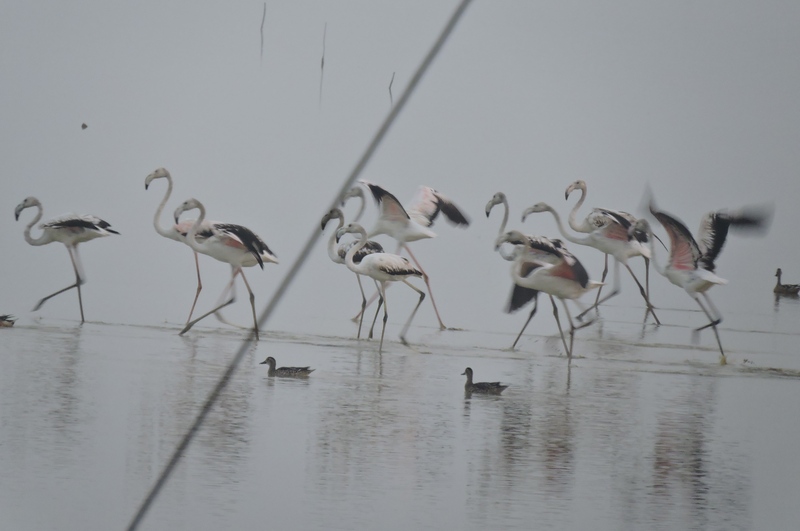 As the flamingos were heading towards the river, they suddenly started moon-walking! The wind was so strong that they had to dance to maintain balance, often going back and forth to remain as a group. It was one of the most mesmerizing spectacles I had ever seen. And that’s all I needed to see. It was love at fourth sight. Pulicat Lake, near the Tamil Nadu-Andhra Pradesh border, is India’s second largest brackish-water ecosystem. It is a wonderful place for birding one’s heart out. Seabirds and raptors roam, in large numbers. Several flocks of Greater Flamingos visit during the late summer – early monsoon season. The nearby shrub forests and marshlands also host a hearty selection of passerine birds. I just stayed still, knee-high in wet mud and waited for them to wake up. Either I scared them away (in which case boooooo to me) or something else did, and they flew and took a part of my spleen with them. Yeah the spleen. People say heart this heart that but the spleen, I tell you. It’s magic! I love how you bring us into your world through birds. It’s always a pleasure. And i hope others can find parts of themselves or at least suitable calmness through these birds. i have never seen a single flamingo in my life(so far), let alone ”A few hundred Flamingos”… . Mother India! my favorite bird and nice words! I love the images and the poem! Great work! simple, poignant and endlessly eloquent without wasting words. Well done! The blogger Christybharath posts some really interesting stuff on his blog. Check it out! Yeah, tugs at the long-leggedness in our souls! ‘It was love at fourth sight.’ You crack me up! Flamingos don’t wow you? What?! I looked at that flocking shot you took at the sky and all I could say was Whhhoooooa!! Your photos are fantastic. I love this poem the best. Vivid imagery in your words. Oooooh believe me Shannon so many whooooas drifted through my ears upon sight. I thought I was having a delayed acid flashback from last decade. And thank you abundantly as always!